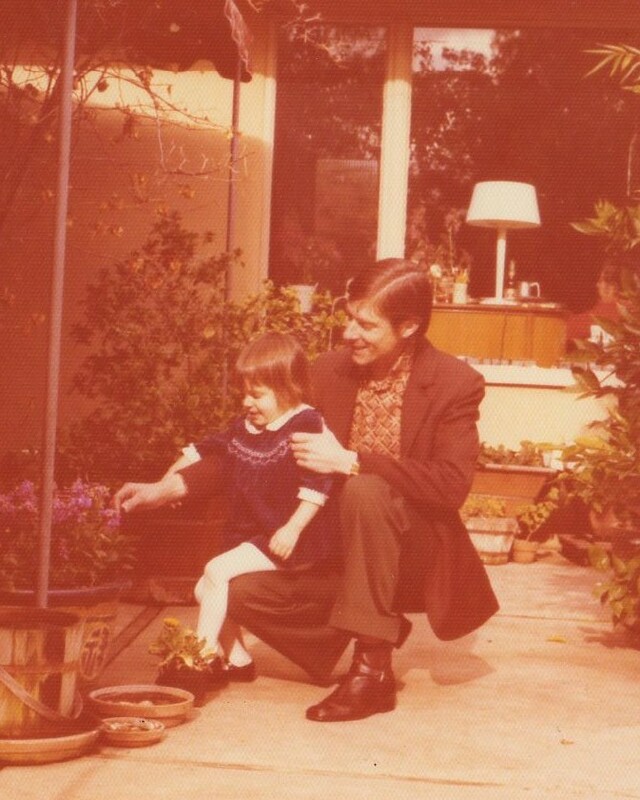 Mom would arrive home from the store the evening before or the day of dad's birthday with the cake in a domed clear plastic carrier, tall and extravagantly decorated with rosettes around the edges and a red maraschino cherry on top. After dinner the cake would be plated and brought to the table; lights would be dimmed, candles lit and Happy Birthday sung. We'd sit around the table enjoying generous slices of cake with dad's favorite accompaniment, Dreyer's Grand French Vanilla ice cream, giggling and joking as the sugar made us increasingly giddy. 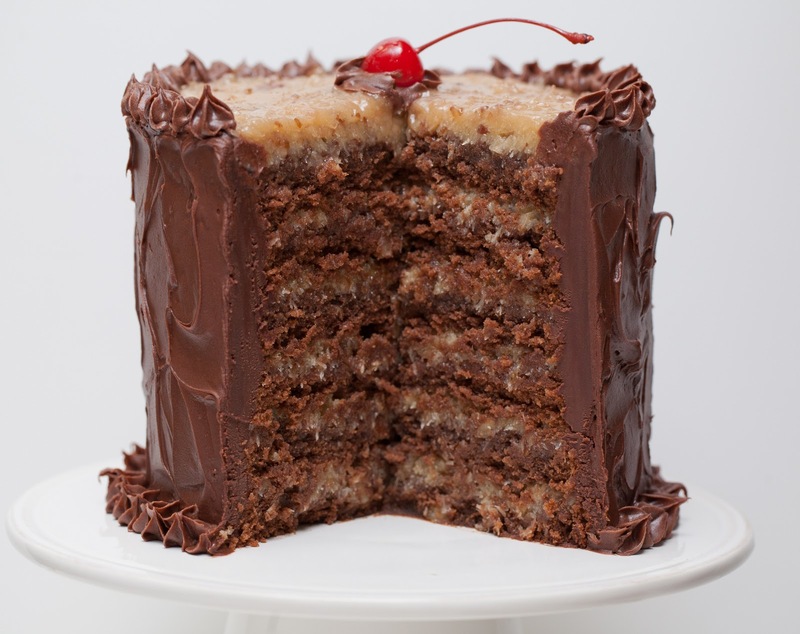 There's not a doubt in my mind that dad would have wanted you to have a slice of this German chocolate cake -- because it's so good. I hope you'll make and share it with someone you love. And, as you make your New Year's resolutions, please consider designating yourself as an organ donor. Be sure to discuss and formalize your plans with your loved ones so that they're comfortable honoring your wishes. For more information, please visit the United Network for Organ Sharing (UNOS). Makes one 9-inch four layer, or 6-inch six layer, cake. 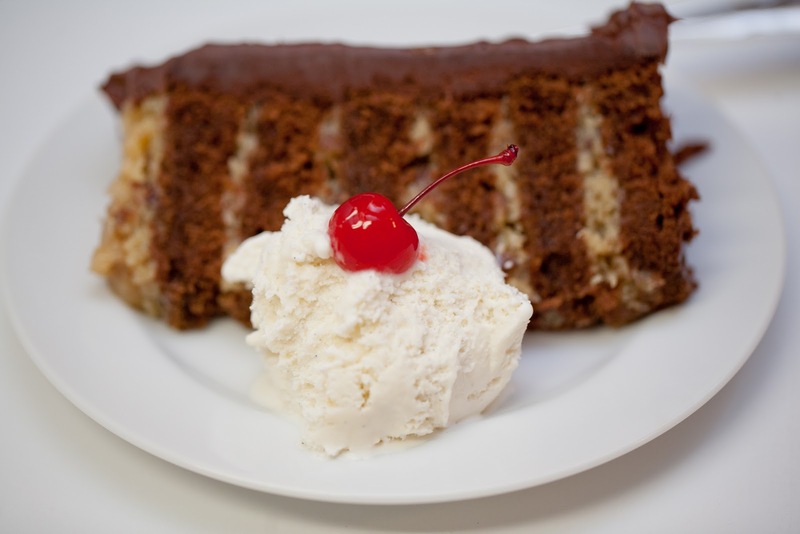 I'd never made German chocolate cake and wanted it to be perfect, so I consulted several cookbooks and food blogs before settling on this recipe from David Lebovitz, who adapted it from his former Chez Panisse colleague Mary Jo Thoresen. I made no changes to the cake layers or syrup, but increased the amounts of pecans and coconut in the filling. I also used my own recipe for chocolate icing, as I prefer a lighter chocolate buttercream over the dark chocolate ganache. The latter is a bit intense for the delicate rum-infused cake and nutty filling. I can understand why my mom bought a German chocolate cake rather than make it from scratch, as this is a multi-step recipe that will take most of a day to make. But the result is well worth the time and effort. 1. Heat oven to 350° F. Grease two 9-inch or three 6-inch cake pans and line the bottoms with rounds of parchment or wax paper. 2. Melt both chocolates together with the 6 tablespoons of water. Use either a double-boiler or a microwave. Stir until smooth, then set aside until room temperature. 3. In the bowl of an electric mixer, or by hand, beat the butter and 1 1/4 cup of the sugar until light and fluffy, about 5 minutes. Beat in the melted chocolate, then the egg yolks one at a time. 4. Sift together the flour, baking powder, baking soda and salt. 6. In a separate metal or glass bowl, beat the egg whites until the hold soft, droopy peaks. Beat int he 1/4 cup sugar until stiff. 7. Fold about one third of the egg whites into the cake batter to lighten it, then fold in the remaining egg whites until there's no trace of egg white visible. 8. Divide the batter into the prepared cake pans, smooth the tops, and bake for about 35 minutes for 6-inch cakes or 45 minutes for 9-inch cakes, until a toothpick inserted into the center comes out clean. Cool cake layers completely. While the cakes are baking and cooling, make the syrup, filling and icing. 1. In a small saucepan, heat the sugar and water until the sugar has melted. Remove from heat and stir in the dark rum. 1. Put the 3 ounces butter, salt, toasted coconut and pecan pieces in a large bowl. 2. Combine the cream, sugar and egg yolks in a medium saucepan. Heat the mixture and cook, stirring constantly and scraping the bottom as you stir, until the mixture begins to thicken and coats a spoon (an instant-read thermometer will read 170° F). 3. Pour the hot custard immediately into the pecan-coconut mixture and stir until the butter is melted. Cool completely to room temperature (the mixture will thicken). 1. In a small saucepan over very low heat (or a double boiler set over but not touching simmering water in the bottom pan), melt the chocolate, stirring constantly, until it's melted and smooth. Remove from heat and let cool to room temperature. 2. In the bowl of an electric mixer fitted with the paddle attachment, combine the powdered sugar, butter, 3 tablespoons milk, vanilla and salt. Beat on low speed until combined, about 1 minute. Stop the mixer and scrape down the sides of the bowl. Increase the speed to medium and beat for 2 minutes, then reduce the speed to low. Add the chocolate and beat until combined, then increase the speed to medium and beat for 1 minute more. 1. Remove the cake layers from the pans and cut in half horizontally, using a serrated bread knife. 2. Set the first cake layer on a cake plate. Brush well with syrup. Spread 1/2 to 3/4 cup of the coconut filling over the cake layer, making sure to reach the edges. Set another cake layer on top. 3. Repeat, brushing each cake layer with syrup, then spreading coconut filling over each layer, including the top. 4. Ice the sides with the chocolate icing, then pipe a decorative border of chocolate icing around the top, encircling the coconut topping, and at the base of the cake if desired. Thanks, Elizabeth! It tasted amazing. It's definitely worth making; let me know if you do! Thanks for posting your beautiful GC cake. 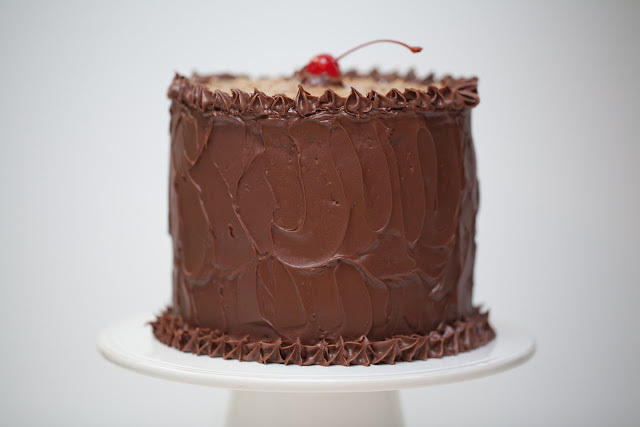 It looks amazing (especially your chocolate frosting). I will be making it for a dessert auction to benefit my kid's school later this week! Thanks, Lisa! I hope the cake is a success and brings in some funds for your kids' school! My brother always has a german black forest cake for his birthday, so this year I made him this one. It was so delicious and a fantastic hit with everyone who had a slice! My only suggestion would be to clarify the amount of sugar in the syrup. I used about 2 cups since I wasn't quite convinced 1/2 cup would work. © 2010-2013 Flour Child. All rights reserved. Header photo © Dani Brubaker. Used with permission. Simple theme. Powered by Blogger.